Field work and research carried out by Sea Shepherd New Zealand as part of Operation Pahu has found some Hector’s (Pahu) populations are disappearing or gone forever from the South East coast of Te Wai Pounamu. Hector’s dolphins don’t stray far from home, with movements over 100km very rare. Their alongshore range is around just 50km. Only some individuals are adventurous, traveling to visit other pods. The species is made up of a series of distinct subpopulations like a necklace around the South Island. Genetic studies and lack of Photo-ID matches all support this. Each subpopulation is important, for adjacent genetic exchange, of which there is a stepping-stone pattern along coasts, and each is a critical link for the species as a whole. 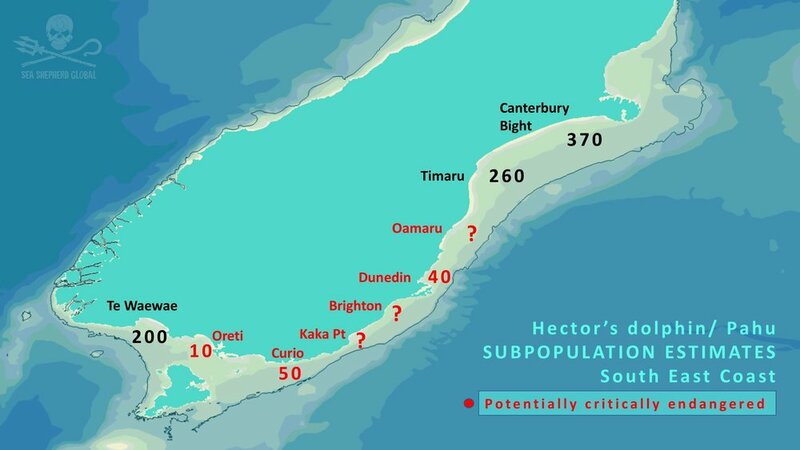 There used to be more than 50,000 Hector’s dolphins around Aotearoa. Now they are only abundant off the middle coastal parts of the South Island. In other areas, most subpopulations are becoming increasingly fragmented. The exception is Banks Peninsula, this subpopulation is slowly increasing. Many are just as critically endangered as Māui dolphins. Subpopulations like Kaka Point (Northern Catlins) and Brighton (South Dunedin) where Pahu were historically abundant are now possibly gone forever or seldom seen. The Dunedin Taiaroa Head population is critically endangered with only 40 remaining and so too Oamaru with as few as 20 left. Te Waewae - a Marine Mammal Sanctuary? Copyright Sea Shepherd New Zealand 2018.